The Texas Regional Radio (TRR) Music Awards Show and Radio Summit Group are proud to announce the 9th annual Texas Regional Radio Music Awards Show where many esteemed Texas/Red Dirt Music radio programmers from all over the southwest region of the united states will attend and where the best of the best Texas/Red Dirt artists will receive recognition for their accomplishments in the Texas/Red Dirt music scene. The awards show was created to recognize artists in the format for their sacrifices, accomplishments and passion. The event will be split into two days and event locations. The Future Faces Show will be held at the PBR Cowboy Bar located in the esteemed Texas Live! facility in Arlington and the awards show held once again in the newly renovated Arlington Music Hall. It will continue to offer legitimate, authentic and logical awards based on radio and chart success, touring success and fan input. 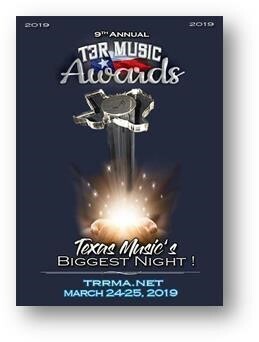 The event will not only attract prestigious radio programmers and Texas/Red Dirt superstars, but also music industry experts from within the Texas music industry, the Nashville scene and fans alike. This year, TRR will host a red carpet walk prior to door opening and seating, where artist and radio personalities will stroll into the auditorium. The red carpet event will be hosted by Eric Raines and Rita Ballou from KOKE-FM radio in Austin.